It's finally starting to warm up, and babywearing has never been cooler than with the MyCarrier Cool from Stokke. Babywearing has loads of benefits for both moms and their little ones. Your child feels safe and warm, and babywearing allows you to go about your day while keeping her close. Stokke has recently added to their line of baby carriers with the MyCarrier Cool, which combines their ergonomic carrier with light and breathable material. The Stokke MyCarrier Cool (Stokke, $220) comes in cream or black, and boasts breathable and water-resistant material fashioned from soft 3D mesh fabric that is designed to draw heat and moisture away from the parent and baby. The MyCarrier includes three components, which consist of the main harness with integrated hip belt, front carrier, and back carrier. Secured by double locking carabiners, it's made with safe, soft, breathable organic cotton textiles, and all materials are free from harmful substances. Like their other carriers, the MyCarrier Cool is designed with comfort in mind. 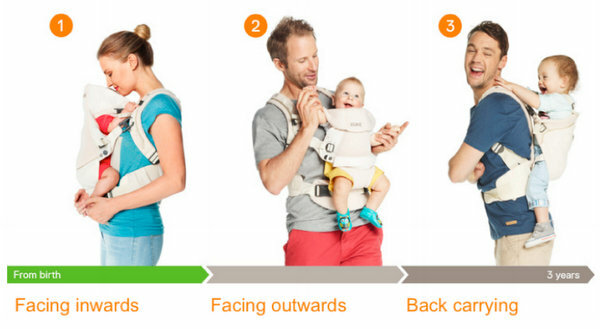 When facing inward, the carrier cradles the child's hips in the best position, and we found that when facing outwards, the carrier offers more support than other mainstream forward-facing baby carriers. The sturdy ergonomic back plate helps ensure comfort for adults, too. I had my friend Sarah test the carrier out for me, as she has a 7-month-old baby girl. We both loved the material and how soft and flexible it is. She enlisted the help of her husband to put it together, and as a team they got it together and holding her baby in less time than I'd pictured. "I really like the Stokke carrier," she tells me. "My first impression was that it was pretty fiddly, and it would take a while to sort through all the latches and clasps. There is a bit of a learning curve, but it's no worse than other structured carriers. What I really like most is the metal brace that slides into the back of the harness. It takes the pressure off my back and redistributes it to my hips... very comfortable!" While it was a bit complicated at first, with repeated use Sarah shares that it's super easy to use, and loves how cool it keeps them both. Note: Stokke sent a free carrier for review, but the recommendations are my own and those of my tester.